This photo taken from a U.S. military plane shows Chinese activity at Mischief Reef in the Spratly Islands in the South China Sea. China is building military facilities on disputed reefs and islands in the South China Sea. Colby said the strategy in no way diminishes the U.S. focus on terrorism, which he termed "a very serious threat." But the document states, "Inter-state strategic competition, not terrorism, is now the primary concern in U.S. national security." The new Pentagon strategy is in contrast to the National Security Strategy outlined last month with a statement from President Trump that mentioned neither Russia nor China, but instead focused elsewhere. "We are rallying the world against the rogue regime in North Korea," Trump said in his statement, "and confronting the danger posed by the dictatorship in Iran, which those determined to pursue a flawed nuclear deal had neglected. We have renewed our friendships in the Middle East and partnered with regional leaders to help drive out terrorists and extremists, cut off their financing, and discredit their wicked ideology. We crushed Islamic State of Iraq and Syria (ISIS) terrorists on the battlefields of Syria and Iraq, and will continue pursuing them until they are destroyed. America's allies are now contributing more to our common defense, strengthening even our strongest alliances. We have also continued to make clear that the United States will no longer tolerate economic aggression or unfair trading practices." At the Pentagon briefing, Colby declined to specify exactly how the U.S. military's advantage is eroding, saying only that both China and Russia are moving ahead "across all domains," including maritime and aerospace. Colby pointed to Russia trying to "brazenly" change borders, a reference to Russia's seizure of Crimea and also its continued incursion into Ukraine. "Russia has violated the borders of nearby nations," the document states, "and pursues veto power over the economic, diplomatic and security decisions of its neighbors." China, Colby added, while not "brazen or overt," is working to expand its military presence in the South China Sea. 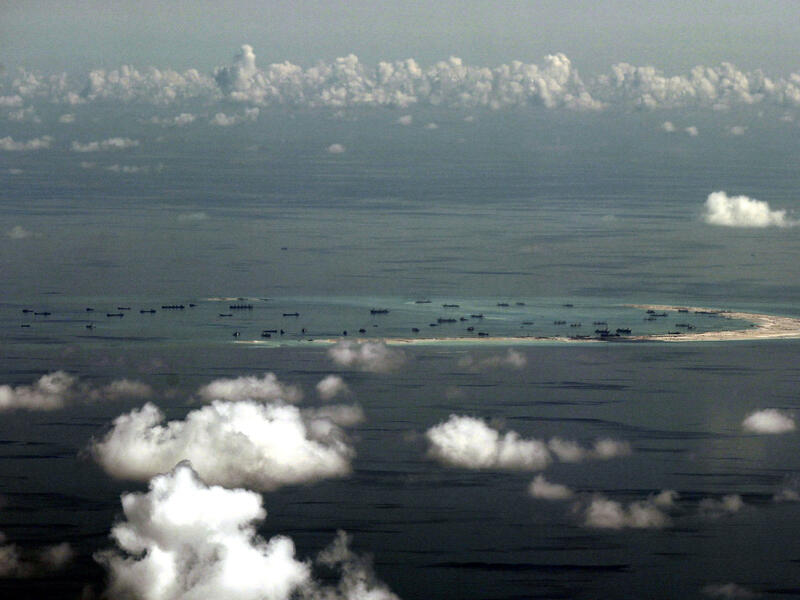 China is seizing small islands and reefs, often putting in radar or runways. "China is a strategic competitor," the document says, "using predatory economics to intimidate its neighbors while militarizing features in the South China Sea." The U.S., Colby said, must focus on the "coercion and intimidation" of both countries. The document says that the Pentagon will have to "out-think, out-maneuver, out-partner and out-innovate revisionist powers, rogue regimes, terrorists and other threat actors." And to do that, the strategy calls for a more lethal, resilient and rapidly moving joint force, not like the one, Colby said, that won the 1991 Gulf War. That large military force, which ejected Saddam Hussein's forces from Kuwait, included a months-long effort to move troops and materiel to the Middle East. The strategy also emphasizes "strengthening alliances as we attract new partners," while reforming the Pentagon's business practices for greater performance and affordability. Reformed business practices, officials say, are of particular interest to the No. 2 Pentagon official, Patrick Shanahan, a former Boeing executive. This new strategy is the first one since 2014 and it does not identify climate change as a threat to national security, which had been a concern of top level Pentagon officials during the Obama administration. "The omission of climate change in the new (strategy) is notable in that it is the latest example of how top-level climate censorship is transforming the letter of the law, but may not impact actual policy execution," said a statement from Climate Nexus, a public policy project sponsored by the Rockefeller Philanthropy Advisors. Still, the statement said that experts predict the change will not have a significant impact on Pentagon practices, since the military services have embraced the challenges of global warming and climate change, such as the Air Force and Navy turning to biofuels, as a way to save money and address climate change. That effort expanded under the Obama administration. Investing more in space and cyberspace "as war-fighting domains"
Creating a more lethal force through the ability to strike an adversary's air and missile defense networks and also enhacing "close combat lethality in complex terrain"
Investing in ground, air, sea and space forces that can "deploy, survive, operate, maneuver and regenerate in all domains while under attack."